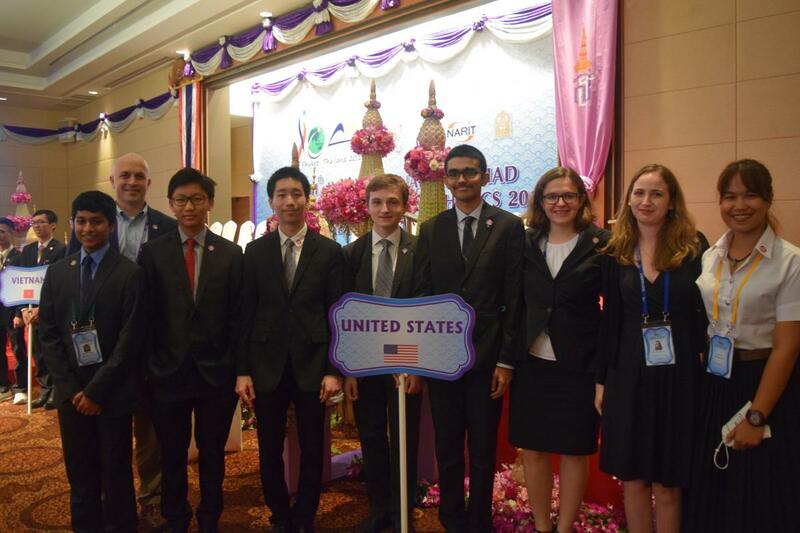 The USA team has returned triumphant from the 11th edition of the International Olympiad in Astronomy and Astrophysics (IOAA), which took place in Phuket, Thailand between November 12th-20th, 2017. More than 200 students from 44 countries participated at this year's edition of IOAA, marking the largest event since the inauguration of the Olympiad in 2007. Student participants competed in 4 different exams, testing their skills in theoretical, data-analysis, and observational astronomy, as well as a team competition which took place in a Planetarium. The AAVSO has been a partner and supporter of the IOAA USA team since 2015. This year's team comprised of 5 high-school students who were accompanied by 2 team leaders and one observer, and they have achieved the best result in the history of the USA' participations at IOAA, bringing back two gold medals and three honorable mentions. The only other team at this year’s event achieving two gold medals was the host country of Thailand, thus the USA team took the second place in the medal tally out of 44 participating countries. The two gold medals were won by Mr. Hagan Hensley and Mr. Jason Yang. Hagan is a senior at Stanford Online High School; he is passionate about cosmology and enjoys taking advantage of the darker skies in the Texas hill country for night observations. Jason is a senior at West Windsor-Plainsboro High School North, NJ, with a particular interest in extrasolar planets, and an avid follower of the latest results from NASA and SpaceX. The honorable mentions were won by Mr. Siddharth Sridhar, Mr. Andy Zhu, and Mr. Shubhanga Ballal. Siddharth was born in Fremont, California and he is currently in his senior year of high school in Chennai, India. He is very interested in celestial mechanics, because he finds it to be an essential tool for modeling the Universe. Jason, who is a senior at Canyon Crest Academy, San Diego, CA, says that he dreamed of being an astronaut as soon as 2nd grade, and has attended astronomy courses at a local college which allowed him to improve his problem-solving skills. Shubhanga is a senior at LASA, in Austin, Texas, and his interest in astronomy was sparked in elementary school when watching “The Fabric of the Cosmos” on NOVA. The students were accompanied by two coaches - Ms. Ana-Roxana Pop and Ms. Ioana Zelko, both PhD students in Astronomy at Harvard University and previous participants at the IOAA themselves. In recognition of their achievements, all participants will receive a one-year complimentary AAVSO membership.